This league is currently in progress and is scheduled to end on August 09, 2015. SUMMER PINBALL LEAGUE starts up Sunday June 14th!! One time $15 Entry fee. All paid entry fees go back to the players as cash prizes at league end!!! Play 8 weeks. 6 games/week. Playtimes as usual: Sundays at 1pm, Mondays, Tuesdays, or Wednesdays at 7pm. If you new to Kidforce Pinball league This fall Your 15$ League Due will be waived!!! YES NEW PLAYERS GET IN FOR FREE!!!!! New location holds 20 machines at this time, more to come. Over 1500$ in cash and prizes. Bring some friends Considering the amount of new people wanting to join C, D divisions will have more cash up for grabs. 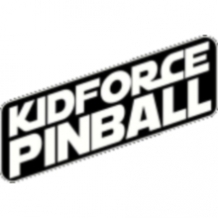 Kidforce Pinball is one of the biggest leagues in the Country, All ages and skill levels are welcome. 1. We will be having a Single makeup week for players. If u miss 1 week bank of games you will be able to make up those 6 games. Date TBA. 3. Games for the 8 week league will not Rotate. We will keep the same lineup for the full 8 weeks. 4. IF WE REACH 150 Players for SUMMER we will be giving away another PINBALL MACHINE. Value 1000$+ WE ALWAYS STRIVE TO GIVE THE MOST BACK TO OUR LEAGUE MEMBERS!! Game list includes.....Varkon, Addams Family, Time Machine, Getaway, Tron, Family Guy, Star Trek, Scared Stiff, Roadshow, New Stern Star Trek, Metallica, Avatar, Dracula, Monster Bash, Guns N Roses, Wheel of Fortune, Fish Tales, Terminator 2, Attack From Mars...with more to come!!! !